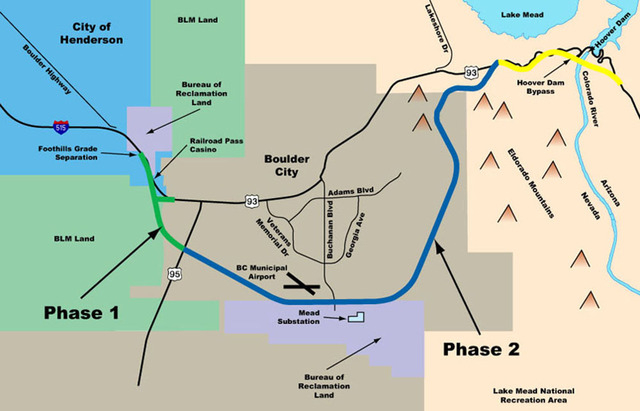 The Regional Transportation Commission is moving forward on the next phase of the 15-mile portion of Interstate 11 that will circle Boulder City to the south. Chairman Larry Brown said April 10 that asbestos and the lack of communication between departments hampered the I-11 project. Naturally occurring asbestos was found in Boulder City in November, but Brown said the Nevada Transportation Department didn’t tell the RTC about the problem when it happened. Instead, commissioners found out from newspaper articles. Brown emphasized the importance of effective communication among all parties in the project, saying a delay for a couple of months is already scheduled. He also said Gov. Brian Sandoval raised concerns about the lack of progress during a Transportation Department meeting Monday. Sandoval is chairman of the department’s board. The next step is for RTC and the Transportation Department to each conduct a study about their respective components of the 15-mile corridor, Brown said. The RTC is in charge of the 12½ miles closest to the Arizona border, while the Nevada agency supervises the other 2½ miles. The RTC should have its study done by May, and the state should have its done by August, Brown said. The RTC will then conduct a survey that will be sent to the Federal Highway Administration for approval. The federal agency will review the study and test asbestos levels in the area. Boulder City Public Works Director Scott Hansen commended the RTC for its work with the project thus far. The commission voted unanimously to approve a process to bid its portion of the bypass, a design-build project for a four-lane highway that would circle Boulder City with a timeline for an October bid award. Three joint ventures cleared an initial request for qualifications on the project. The $600 million project won’t cost Boulder City any money, Hansen said.